Advance 3Q GDP growth of 6.3% qoq beat expectations, with growth across the board except for the private construction sector. MAS dropped the phrase “extended period” from its policy statement. We believe if growth momentum sustains, a tweak towards modest appreciation is likely in Apr 18. Venture Corporation (VMS SP) for visible growth in volume. Led by a sharp acceleration in manufacturing growth, the Singaporean economy expanded 4.6% yoy in 3Q17, up from 2Q17’s 2.9% pace and stronger than market expectations of 3.8%. This is the strongest annual growth since 1Q 2014’s growth of 4.9% yoy. On a quarterly basis, the advance estimate, based largely on data from July and August, showed that the economy grew an annualised 6.3% in 3Q, sharply surpassing the 2.4% of the previous quarter and above consensus’s 3.7%. The manufacturing sector (20% of the economy) expanded 23.1% qoq annualised or 15.5% yoy as all key clusters, led by tech manufacturing, contributed to 3Q growth. Despite the continued drag from construction (due to private construction activities), the overall goods-producing industries grew an estimated 10.4% yoy in 3Q, the strongest since 1Q 2011’s 15.1% spike. Led by finance & insurance, logistics, and wholesale & retail trade, the service-producing industries (60% of GDP) expanded by c. 2.6% yoy in 3Q, similar to 2Q’s 2.5%, the strongest back-to-back growth in 2 years. Even with stronger yoy real GDP growth for Jan-Sep 17 at 3.3% (Jan-Sep 2016: 1.7% yoy), well outside the current official growth forecast of “the upper half of the 2-3%”, the MAS kept its monetary policy unchanged in the latest policy statement, although it dropped the phrase “extended period” from its statement. Instead of saying that “the neutral policy would be appropriate for an extended period” as it had in its previous statement, the central bank now says that it “will maintain the rate of appreciation of the S$NEER policy band at the zero percent. The width of the policy band and the level at which it is centred will be unchanged”. MAS expects MAS Core CPI to be broadly stable going into 2018 (1-2%) while the economy is likely to “expand at a steady, but slightly slower pace in 2018 compared to 2017”. Our private bank economist maintains his GDP of 3.5% for 2017 and 3.6% for 2018. It seems that despite the stronger-than-expected 2017 GDP growth, the MAS, like other central banks, are mindful of persistent downside risks to growth and inflation. Nonetheless, for an open and export-dependent economy such as Singapore, it is encouraging to note the recent upgrade to global growth by the IMF. It nudged up its forecasts for global economic growth to 3.6% and 3.7% for 2017 and 2018, respectively, or a 0.1% pt upgrade for each year. We believe the current growth is likely to be sustained into 1Q18, driven by manufacturing and broadening growth across sectors (property/logistics/finance). This could set the stage for a tweak in MAS policy towards a modest appreciation to contain inflation expectations in Apr 18. We believe the heightened government land sale and enbloc redevelopment craze YTD (c. 12,800 potential launches) will spur the private construction sector in 2018. Overweight on property and manufacturing sectors. 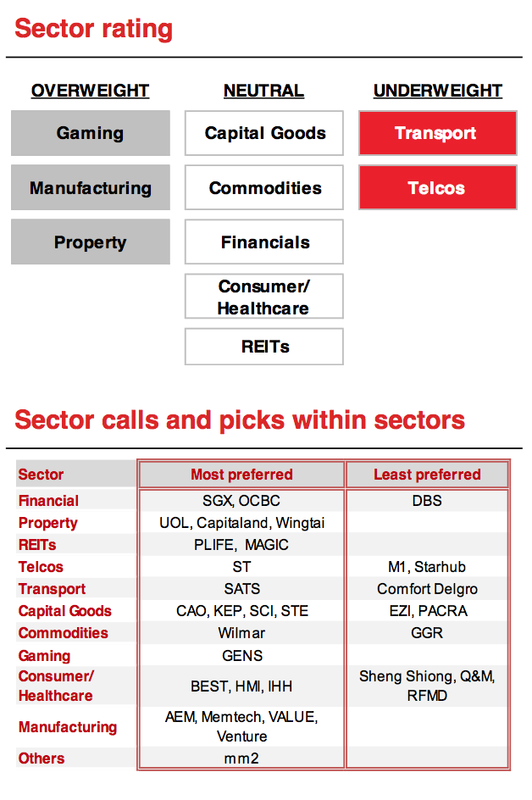 We add Keppel Corp (KEP SP) to country top picks on improving sentiment in O&M and Singapore property and Venture Corp (VMS SP) on visible volume growth into 1H18. We think the negative revision cycle is over and there could be continued improvement in sentiment, driven by Singapore property and O&M. More than 60% of our SOP is dominated by Keppel Land (S$4.69) and Tianjin Eco City (S$0.62). We expect stronger 2H17 earnings to be driven by test & measurement, medical and networking customers. There is a potential for higher dividend from the sale of Fischer Tech. Our Target Price is based on 17.3x FY19F P/E, (0.5 s.d. above historical 10-year average of 15.2x).